This is one of the most popular and common food items that are consumed on an almost daily basis in south India. Sambar is made from a combination of local vegetables, pulses and spices to make a tangy and spicy main course recipe. Traditionally it is eaten with boiled rice though local population likes to consume it with other recipes too. Sambar tastes best when it is served piping hot though you can keep it for up to 2 days. If some of the vegetables mentioned in the list are not available in your area, you can use local substitutes. The flavor of this recipe is mild and can be elevated by adding some more red chilies. Let's make this popular and tasty recipe consumed by millions in the Indian peninsula. 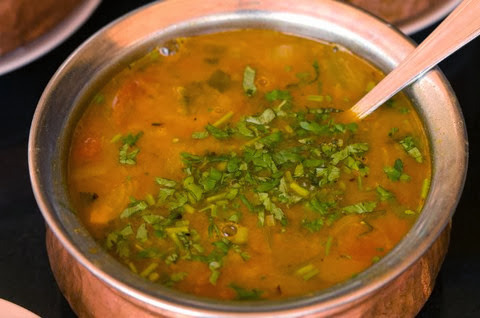 Do make this classic Sambar recipe of South Indian origin made with loads of vegetables and authentic Indian spices giving it a unique and tasty flavor. Soak tamarind paste in half cup of lukewarm water and keep aside. Peel and chop bottle gourd into small pieces and keep aside. Heat 2 tsp refined oil in a nonstick pan. Add whole red chilies, 4 to 5 curry leaves, grated coconut, asafoetida, Bengal gram, coriander seeds, cumin seeds and fenugreek seeds in it. Roast until grated coconut turns golden brown. Add 1/4 cup of water in it and blend into a smooth paste. Add red gram, turmeric powder, salt and 4 cups of water in a pressure cooker. After the first whistle, lower the flame and cook for 5 minutes. Take a large spatula and mash the boiled red gram within pressure cooker. Add blended paste prepared earlier with soaked tamarind paste, onion, bottle gourd, drumsticks, 4 to 5 curry leaves and 3 cups of water. Again close the pressure cooker and bring it to full pressure. After the first whistle, lower the flame and cook for 3 minutes. Heat 2 tsp refined oil in a pan and add mustard seeds in it. Let them crackle for about 2 minutes. Add it in the cooked sambar and garnish with chopped coriander. Serve hot with steamed or boiled rice.